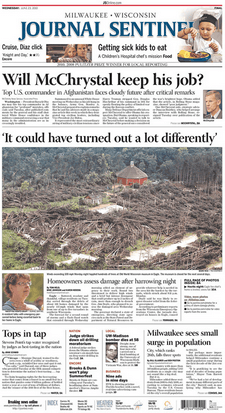 The Milwaukee Journal Sentinel is a daily morning broadsheet printed in Milwaukee, Wisconsin. It is the primary newspaper in Milwaukee, the largest newspaper in Wisconsin and is distributed widely throughout the state. It is owned by the Gannett Company. In early 2003, the Milwaukee Journal Sentinel began printing operations at its new printing facility in West Milwaukee. In September 2006, the Journal Sentinel announced it had "signed a five-year agreement to print the national edition of USA Today for distribution in the northern and western suburbs of Chicago and the eastern half of Wisconsin." The Milwaukee Sentinel was founded in response to disparaging statements made about the east side of town by Byron Kilbourn's westside partisan newspaper, the Milwaukee Advertiser, during the city's "bridge wars," a period when the two sides of town fought for dominance. The founder of Milwaukee, Solomon Juneau, provided the starting funds for editor John O'Rourke, a former office assistant at the Advertiser, to start the paper. It was first published as a four-page weekly on June 27, 1837. A deathly ill O'Rourke struggled to help the paper to find its feet before he died six months later of tuberculosis at the age of 24. On Juneau's request, O'Rourke's associate, Harrison Reed, remained to take over the Sentinel's operations. He continued the struggle to keep the paper ahead of its debts, often printing pleas to his advertisers and subscribers to pay their bills any way they could. Meanwhile, the establishment of the Whig party in the territory thrust the Sentinel into the hurly-burly of partisan politics. In 1840 Reed was assaulted by individuals whom the Sentinel charged were hirelings of Democratic Governor Henry Dodge. Later that year the paper abandoned its independence and proclaimed itself a Whig paper with its endorsement of William Henry Harrison for president in 1840. After the enactment of the Fugitive Slave Act in 1850, King joined Wisconsin Freeman editor Sherman M. Booth in calling for its repeal, and in 1854 denounced the Kansas-Nebraska Act. The Sentinel provided extended coverage of runaway slave Joshua Glover's liberation from a Milwaukee jail on March 11, 1854. After the birth of the Republican party in Ripon, Wisconsin, King helped promote and organize the state party at the founding convention held at the Madison Capitol on July 13. King's Sentinel supported William H. Seward for the Republican presidential nomination in 1860, but rallied around Abraham Lincoln when he emerged as the nominee. Circulation rose with the looming Civil War and the paper expanded to a nine-column sheet with the start of 1861. In 1862 the Sentinel bought Booth's abolitionist newspaper, the Wisconsin Free Democrat, and published it for two months before folding and sending its subscribers the Weekly Sentinel. The Journal was started in 1882, in competition with four other English-language, four German- and two Polish-language dailies. Its first editor was Lucius Nieman, who wanted to steer the paper away from the political biases and yellow journalism common at the time. Nieman was an innovative and crusading editor, and under his watch the paper won numerous awards, including five Pulitzer Prizes. On April 8, 2016, decades of local ownership for both papers ended when Journal Media Group was acquired by the Gannett Company. Gannett owns most of the daily newspapers in the central and eastern parts of Wisconsin (eleven in all), including the Green Bay Press-Gazette and Appleton's The Post-Crescent. The Journal Sentinel has been integrated into the company's "USA Today Network Wisconsin". The Journal Sentinel will now also collaborate with the Press-Gazette for Packers coverage, and will adapt to Gannett standards, including newspaper layout, website and apps in August 2016. ↑ "Audit Bureau of Circulations Report ending 3/31/2008" (website). ABCNewspaper Search. 2008-03-31. Retrieved 2008-03-31. ↑ "Journal Sentinel Inc. Signs Five-Year Contract to Print USA TODAY". Business Wire. 2006. Retrieved 2013-11-05. 1 2 3 4 5 6 "The Story of the Sentinel," Milwaukee Sentinel, December 3, 1893. ↑ Perry C. Hill. "Rufus King and the Wisconsin Constitution". Wisconsin Magazine of History, vol. 32, no. 4(June 1949):416-432. ↑ Richard M. Current. The History of Wisconsin, Volume II: The Civil War Era 1848-1873. Madison: State Historical Society of Wisconsin, 1976, p. 338. ↑ Robert C. Nesbit. The History of Wisconsin, Volume III: Urbanization and Industrialization 1873-1893. Madison: State Historical Society of Wisconsin, 1985. ↑ E. Bruce Thompson. Matthew Hale Carpenter, Webster of the West. Madison: State Historical Society of Wisconsin, 1954, pp. 206-207. ↑ E. Bruce Thompson. Matthew Hale Carpenter, Webster of the West. Madison: State Historical Society of Wisconsin, 1954, pp. 259-261. ↑ Will C. Conrad, Kathleen F. Wilson and Dale Wilson. The Milwaukee Journal. Madison: University of Wisconsin Press, 1964, pp.7-8. ↑ Fulmer Mood. "Frederick Jackson Turner and the Milwaukee Sentinel 1884". Wisconsin Magazine of History, vol. 34, no. 1 (Autumn 1950):21-27. ↑ David P. Thelen. The New Citizenship. University of Missouri Press, 1972, pp. 278-280. ↑ Herbert F. Margulies. The Decline of the Progressive Movement in Wisconsin. Madison: State Historical Society of Wisconsin, 1968, p. 62. ↑ This is based upon the fact that the initial lease was for three years, as well as that according to Frost, S.E., Jr., PhD, Education's Own Stations: The History of Broadcast Licenses Issued to Educational Institutions. The University of Chicago Press, 1937, p. 213, in its license application of December 30, 1930 WISN stated that the newspaper was the owner. ↑ "Top Media Outlets, January 2013; U.S. Daily Newspapers" (PDF). BurrellesLuce. January 2013. Retrieved 2016-07-31. ↑ "Gannett Completes Acquisition of Journal Media Group". USA Today, April 11, 2016. ↑ Murphy, Bruce (13 October 2015). "How Gannett Will Shrink the Journal Sentinel". UrbanMilwaukee,com. Retrieved 8 May 2016. ↑ Gores, Paul (7 April 2016). "Gannett purchase of Journal Media Group approved". Milwaukee Journal Sentinel. Retrieved 17 April 2016. ↑ Stanley, George (23 July 2016). "Editor's Note - Print and digital updates coming". Milwaukee Journal Sentinel. Retrieved 30 July 2016. ↑ Bednarek, David J. "Journal won esteemed Pulitzer Prize 5 times," The Milwaukee Journal, 31 March 1995: SS14. ↑ Sandin, Jo, "Last in the newsroom, women scored many firsts," The Milwaukee Journal, 31 March 1995: B1, Final Metro. ↑ "Milwaukee Journal Sentinel Wins 2008 Pulitzer Prize". Reuters. April 7, 2008. Retrieved 2009-04-16. ↑ "The 2010 Pulitzer Prize Winners - Local Reporting". Retrieved 2010-04-13. ↑ "The 2011 Pulitzer Prize Winners - Explanatory Reporting". Retrieved 2011-04-19.